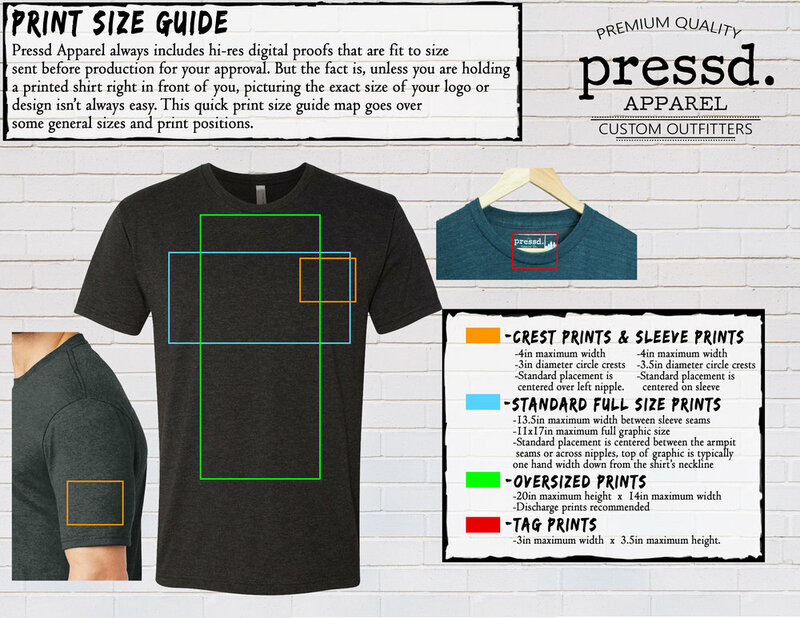 A collection of free resources and tools to help Pressd Apparel clients create the a perfect printed product time and time again. As designers and printers, it's a HUGE help when new clients come to us with a legitimate brand guide. We've seen a lot of different clunky versions in our time, so we're excited to share this free download of what we think is the most efficient brand guide to ensure your logo is always printed accurately. Pressd Apparel prints every shirt with water based or discharge inks, which means Pantone color matching and inks mixed to order for every project. The colors in your logo matter to you, so let's make sure we get them perfect. We will help figure out the closest match, in the mean time feel free to look for the closest options with this color guide. Before we print anything, we always send you hi-res artwork proofs (fit true to size). But we know that unless you are holding a printed shirt right in front of you, visualizing the exact size and position of your logo or design isn’t always easy. This quick print size guide acts as a map with a color coated key going over some general sizes and print positions to help give a better perspective. Hi-resolution product photoshoots can make a massive difference for selling products online. We've put together a 3 pack of product shots with our Pressd Apparel Everyday Tee's in Black, White and Grey on a classic brick background for a nice polished look! Add your artwork or design and enjoy!